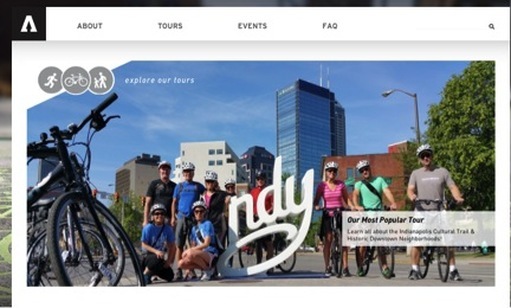 Click On The Tab For "Eat/Drink/Fun"
Offering the only daily, guided tours in Indianapolis, we explore urban Indy at a human pace. Our walking, running and biking tours are conducted at this casual pace with frequent stops where our storytellers share the history and lore of our city. ActiveIndy Tours combines our passion for living a healthy, environmentally conscious lifestyle with a love for the past, present and future of Indianapolis. We create stronger connections between Indy and our guests by conducting tours that are healthy, fun and educational. ActiveIndy was founded by longtime Indianapolis resident and hospitality industry veteran Nathan Smurdon. According to his Mom, as a baby Nathan skipped crawling and went straight to walking… and once the training wheels came off his first bike he never looked back as he headed out to explore the neighborhood.